Ipswich Junior Chess Club restarted in 2016, after a break of 5 years. We provide a friendly environment for young people aged 6-16 to learn and play chess. The emphasis is on informality and enjoyment, but there is also coaching and competition. The club meets every Saturday morning within term time, 09:45 to 11:45 (except the summer term after half term). We will publish all details of open/closed dates in advance, on this website. We use the Lecture Hall at Ipswich County Library, Northgate St, IP1 3DE. The Lecture Hall is on the 1st floor, accessible from the main entrance. Participants pay £2 per person (siblings are £1 for larger families), each week, although there may be an option to pay subs for half a term or the whole term in one go, with a small discount. Parents should be prepared to stay with their children until they have been settled into the club, or for all 8yr olds and younger, and will of course be welcome to help out and play. For more information please get in touch via our email address ipswichjuniorchess@gmail.com. The Library is open downstairs before and after the Club, providing a great range of books and other learning/entertainment media. Throughout this year we will introduce the new grading system, with Bronze, Silver and eventually Gold standard players who have been thoroughly tested. In the meantime, the assessment forms are here, so you can check and see what each grade requires. Note that these criteria are subject to change, but the principle of proving mastery of each listed technique will not. Congrats to the 9 players who have so far achieved Bronze standard. April 27th to May 23rd - club dates, with the club championships being run in these weeks. Breaking up until September after this. There will be 3 parts to the Club Tournament - Long (15 minute) games, Short (5 minute) games and King/Pawn games. Prizes will be awarded to the best Bronze standard and non-rated player in each category (chess books and a medal). There will be handicaps of pieces and/or time applied to the stronger players, to make them work harder and give everyone a better chance. Early warning of a very enjoyable event, held at the Ipswich Senior Club at the start of each season. Time-handicapped Blitz event is good fun - weaker players get more time over their experienced opponents, who often make mistakes when rushing, or simply lose on time if you can keep the game going. Expected to be Tuesday 3rd September, 19:30 until 22:00 latest - more details will be posted when confirmed, normally £1 per player to enter. The Senior club is on Tower St, not far from the Library (full address and directions on the Senior page). The club is run by volunteers, both behind the scenes and each Saturday morning. Any level of help will be appreciated - the club will only be as good as the people helping to run it. If you want to discuss this, without commitment, contact Martin via the email address above or at the club on a Saturday. 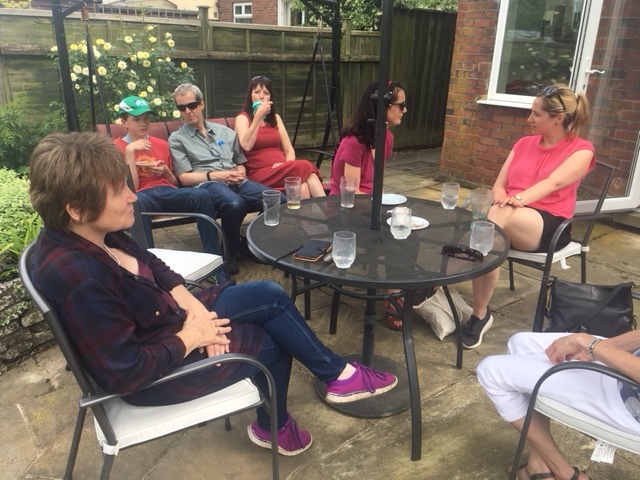 14 players this time, varying piece handicaps, with an impressive 12-2 score in favour of Steve as the only wins against were by Jenni and Caitlin who both had a knight advantage to start. Well done all. 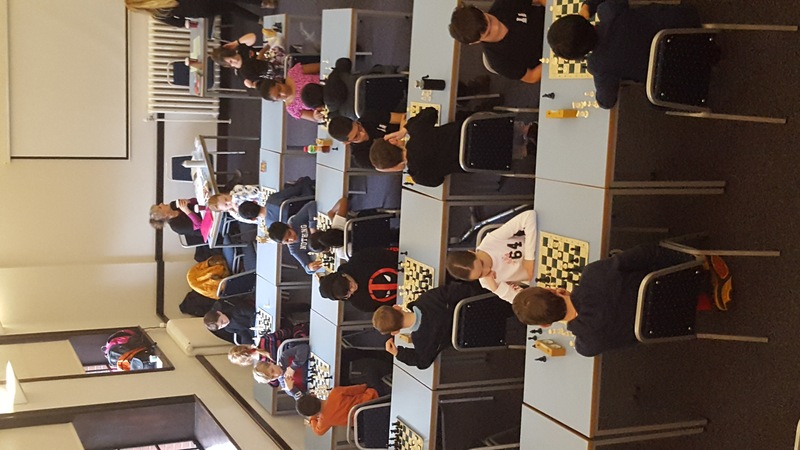 The club hosted a 20 player 5 round swiss Blitz event, with guests from other Junior clubs in Suffolk. Much fun, hard competition but a high standard of chess manners throughout. With extra help running the busy tournament desk from Tim Kent and Leon Burnett, it was a great success with home talent William Davison finishing with a perfect 5/5, ahead of Jonathan Painter (Ipswich) on 4/5 and Raf Calumpiano (Bury Knights) on 4/5 both of whom only lost to William. Well done to evry player, some of whom were using clocks for the first time in anger. The latest grades are out, and Jenni, whose adult grade is 79 (and likely to rise) is currently ranked 98th in the English U16 Girls listings. Congratulations to Jenni. Top 50 by the end of the year maybe? Hmm? Two rounds of matches were played against some of the more experienced (i.e. older!) players from the Senior club. Junior members Jenni, Caitlin, William and Jonathan and then Luke, Alex, Anuj and Dinoja had games against Ken, Roger, Patrick and Jim. 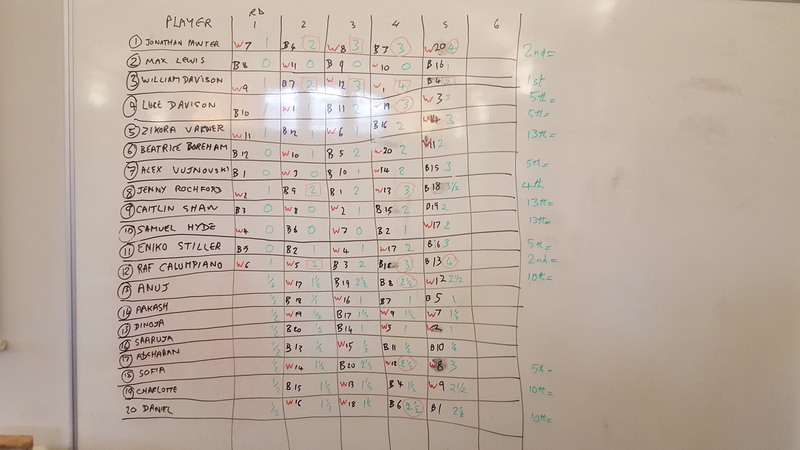 In the end the greater consistency and battle-hardiness of the Seniors produced an 8-0 whitewash, but several of the games were close, notably Caitlin and Alex vs Roger. The first event this year was a Simultaneous display from two of the more experienced club players, Jenni and Caitlin, who played 16 games between them against other club members. It proved a stern test for the girls, with speed of decision making and concentration thoroughly tested. Results were mixed, but considering they were handicapped in several games, it was an excellent effort. Not as easy as it looks! Jenni concentrating here, Caitlin hard at work here. As an end of term treat, 13 players took part in a 5 round swiss tournament where a bell was sounded every 10 seconds, for players to move. It was aimed at quick thinking and tactical play, proving to be good fun for all. 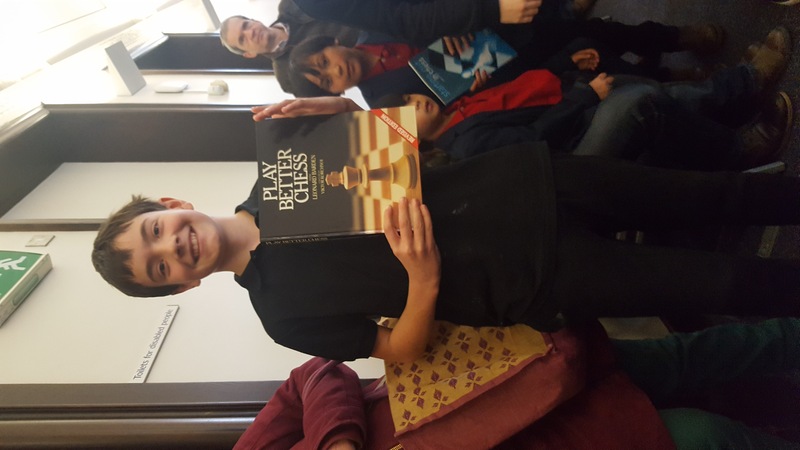 Luke finished unbeaten, seen here receiving a chess book as a prize, courtesy of senior club member Mike Clapham. The scoreboard for the comp is pictured here. Piece handicaps were applied to even up the chances for the less experienced players. Mike Clapham, from Ipswich Senior Chess Club has very generously donated a box of chess books to the Juniors, for use as prizes and teaching aids. Many thanks from all club members. Price for Juniors is £10, for Adults it is £15. You can either wait and they will be delivered to the club for collection, or you can have them posted for another £3.40. Choose the name to put on the back, and boom! The shirt has been tested by Martin, it washes well, seems to be of suitable quality and can be ironed (but only inside-out). Alex, currently Suffolk's highest graded Junior player, took on the ranks of the Junior Club en masse. Allowing his opponenents to choose their colour, and giving away Q, R or N depending on their strength, he played very efficiently in winning 9 and losing only 2 games. Well played Alex, with congratulations to Jonathan Painter (whose play was commended) and Jenni Rochford (who was a touch fortunate) for winning. Pics from the event are here and here. With thanks to Emma (Owen's mum) who is going to post details of club events on Facebook and Twitter this season. She invites you all to "like" the pages and get involved. She would particularly like photos. Final event of the year was at Woodbridge School on June 17th, with plenty of our players involved, all of whom met or exceeded their expected performance. 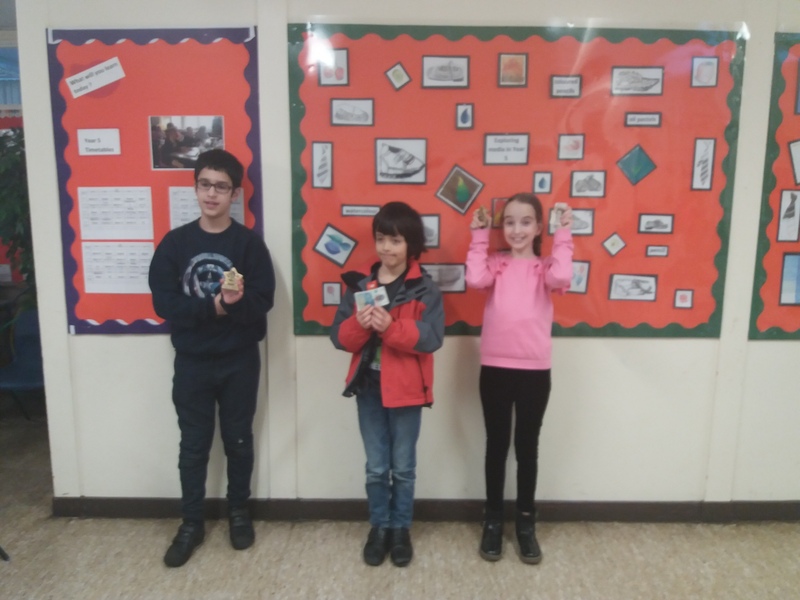 Top of the pile was Alex Sheerin with 6/7, who lost the overall title on a tie-break; Jenni and Caitlin headed the U14's, John-Paul, Eniko and Hamilton all did well in U11/10/9's, being pitched against more experienced opponents. Well done all. Keep your eyes on the Suffolk Junior site, where a full report should follow. In glorious weather, the giant set made an appearance so that the outstanding correspondence match against Martlesham could be finished, which Ipswich won in the end to finish 1-1 in the series (well played both clubs!). 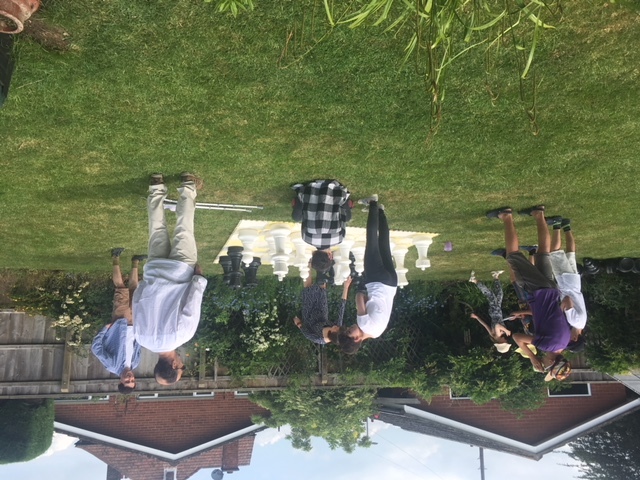 There was also a bit of 4 way chess going on and a general hoofing around in the garden or taking in the sun for parents and helpers. On the video front, 7 rough cut videos on simple chess topics were shot, we hope they work out well and will stick them on this website if so. 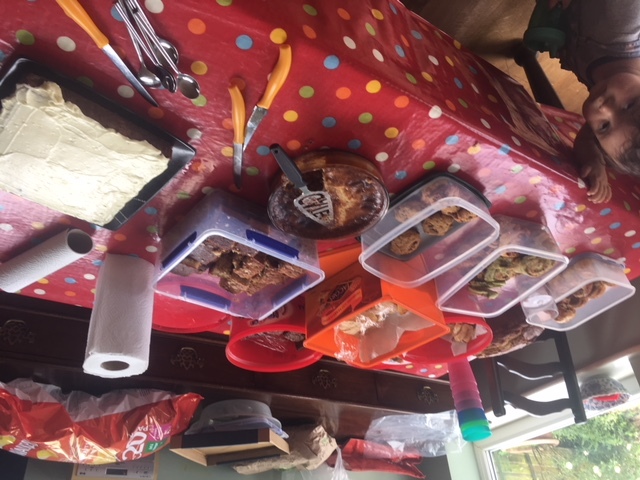 As for the cakes, well now!! What a spread. The prettiest cake (tasted delicious as well of course) was this one, but with such a high standard everyone was caked out by the end. Thank you to everyone for making the day so enjoyable, all 28 attendees enjoyed it very much. A tremendous occasion at the Library today, with an impressive 20 players taking part in the Blitz tournament. Les Jones (fresh off the plane from holiday in Peru) and Ken Lunn from the Ipswich Senior Chess Club ran the event (take a bow, chaps). It was pleasing to welcome Yesin and Adam from the Martlesham Junior Chess Club, who visited us for the tournament. After an absence of many years, Suffolk have submitted teams into regional junior tournaments, in a bid to qualify for the national age-group finals. The organisers of these teams, Tim Kent and Bob Jones, deserve a lot of credit for the amount of work they have put n and the physical effort of getting players to the remote venues.... thanks chaps. U9's last weekend saw Ipswich players Hamilton and Karthik in the team. They both had strong positions against higher graded opponents without success, but the team qualified for the finals so they have the opportunity to do the business in Birmingham later in the year. U11's played yesterday in what is probably the hardest section. Well done to William, Owen and John-Paul who took part, with Eniko scoring highest of our 4 team members with 2 out of 3 on the day. The team was unsuccessful against much stronger opposition, but there is alwsays next year. U18's played in February and were outgraded, outgunned and out of luck. Only Alex Sheerin from Ipswich was in the team, on board 1, but against such high class opposition the results went the way of form unfortunately. It must be remembered that Suffolk is a small county in terms of population, has to travel long distances to compete and has not been taking part for a while, so is relatively inexperienced. We have the players with potential to improve, not just from the existing squads but also from those who did not make the team this time. We intend to play an active part in Suffolk temas on years to come. An impressive 11 of the 23 attendees at this event came from our club, who demonstrated their commitment and ambition handsomely. After morning coaching sessions those involved were split into 3 groups. In the top group Jenni scored 2/3, which Johnathan, William and Karthik all featured against strong opposition. 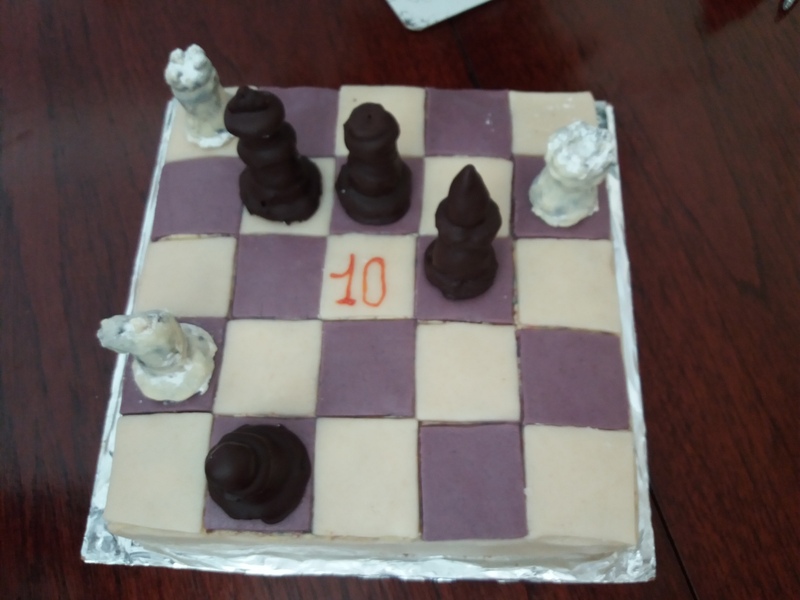 We don't normally report on such events as birthdays (when you get to the age of the organiser's you will understand...) but we had to share a picture of Eniko's cake from her recent 10th birthday. Happy birthday and wow! 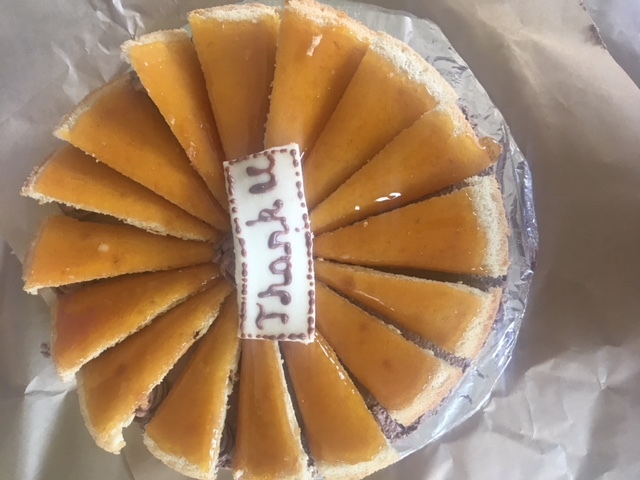 to Marta, who made the cake for her daughter. Steve Gregory, taking time out from coaching at the club, agreed to do a simul event where he started a full Queen down in all games. Only 3 players beat him - step forward Jonathan Painter, Luke and William Davison. The first training camp of the year was held in Bury, with 4 Ipswich club members attending. After 2 coaching sessions and dinner, the 22 players split into 3 groups. In group 2, Jonathan Painter took 1st, Owen Free 2nd place, and in group 3 it was Eniko (3 wins from 3) in 1st and Hamilton narrowly pushed into 3rd, meaning all 4 Ipswich players made the prizes!! Martin played 9 Juniors this time, on the last date before the Xmas break. There were no medal winners this time, just Luke Davison who once again got a draw from a winning position for a round of applause. Honourable mentions also go to Oscar, Eniko and Owen (who went a full queen up but eventually got swindled). Ipswich took a team of 9 players to the Bury Knights - what a fabulous evening. Bury had set up a separate room to allow the games to be played in match conditions. Each Ipswich player had 3 games against different opponents, a tribute to the numbers who attend the Bury club and the expert organisation of Bob Jones. Bury took the opportunity to field their less experienced players, with a few young assassins mixed in, and the results went in favour of the street-wise Ipswich players who ended up winning 20.5 to 6.5, with every player winning at least one game. The bottom boards were dominant for the away team with the senior Ipswich players running up against more experienced opponents on the top boards. More info to follow, but here is the match getting under way, and here are the Ipswich team holding up the number of fingers for the games they won. Simultaneous event a roaring success! On October 21st Martin lined up against 13 club members, playing them all at the same time (that's what simultaneous means, after all...). Martin took white, with each game starting from the Kings Gambit accepted position. This was intended to lead to a quick and wholehearted attack, and indeed it did. Of the 13 games there were many close-fought, with a lot of skill on display. In the end Luke Davison got a draw (for a round of applause) after narrowly missing a couple of mating attacks, but his brother William took the only win for Black for a medal. He was a bit lucky (ok, he played well...). This will be repeated in December. Bring it on! Honourable mentions go to Cayden and Luke, both of whom would have contended but for unavailbility at the wrong time. Bury Knights Junior Club brought a 3 person team to Ipswich on 22nd April. Featuring an 8, 9 and 10 year old, two girls one boy, the greater experience of the Knights counted as they racked up an impressive 14 wins from 16 games played, although the Ipswich players put up a decent test in many of the games. Cayden Judge and Jenni Rochford were the Ipswich victors, Cayden's win coming over Amy John, who is an England player for her age group. Bury Knights also issued an invitation for a return fixture in the autumn - details will follow later this year.